ALEXANDER of ADRUMETUM, martyred in North Africa circa 434. AVITUS II of CLERMONT, Bishop of Clermont in Auvergne from 676 until his repose in 689. St. Avitus was succeeded by his brother St. Bonitus (15th January). It is said St. Avitus built a monastery at the tomb of St. Austremonius (1st November) in Volvic. ERCONGOTHA, a daughter of King Eorcenberht of Kent (r. c. 640–664) and St. Saxburgh (6th July). She received monastic tonsure at the Abbey of Notre-Dame de Faremoutiers where her aunt, St. Ethelburgh (7th July), was Abbess. St. Ercongotha reposed in 660. FELIX of METZ, (Second Century), the third Bishop of Metz, it is believed he served that See for over forty years. GERMANUS and RANDOALD, St. Germanus was Abbot of Moutier-Grandval Abbey, in Granval (formerly Granfel or Granfelden) in the present-day Swiss Jura. St. Randoald was Prior of the same abbey. Both were martyred in after they interceded with the local Duke on behalf of the area’s peasants. GUNDEBERT (GUMBERT, GONDELBERT), a Bishop of Sens, who retired from his See and went to the Vosges in Lorraine to live as a hermit. St. Gundebert also founded Senones Abbey, in the present-day village of Senones in Lorraine, France, serving as its first Abbot. St. Gundebert reposed circa 676. PATERIUS, a monk, disciple, and friend of St. Gregory the Dialogist (3rd September). St. Paterius was, later in life, consecrated Bishop of Brescia in Lombardy. St. Paterius reposed in 606. PÉPIN of LANDEN, Pépin, Duke of Brabant, was the husband of St. Ida (8th May) and the father of SS. Gertrude of Nivelles (17th March), and Begga (17th December). As one of the most important leaders of his age, St. Pépin played a key role in the foundation of the Carolingian dynasty in France and was a strong defender of Christians against Slavic invaders. St. Pépin reposed circa 646. He was initially buried at Landen, but his relics were later translated to Nivelles and enshrined with those of his wife and daughter St. Gertrude. 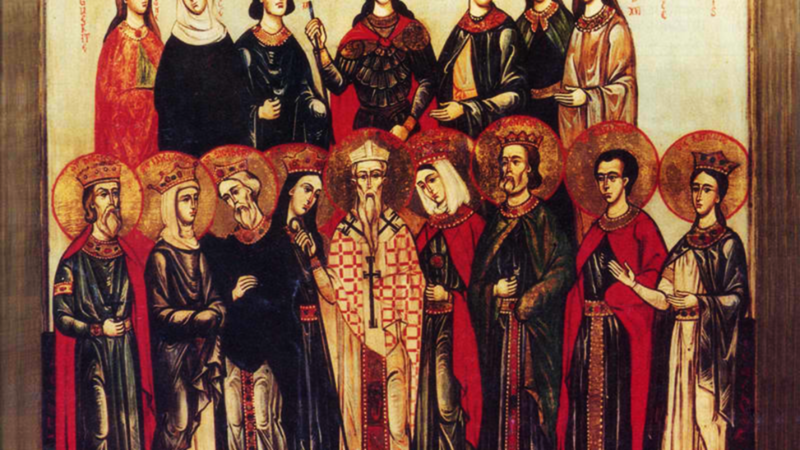 SEVERUS and SIXTY-TWO COMPANIONS, (mid-Third Century), a group of martyrs in Syrmium in Pannonia (present-day Hungary). St. Severus’ name is the only one of the group which is still known. VALERIUS, an Abbot of San Pedro de Montes in Galicia, Spain. He reposed in 695. VERULUS, SECUNDINUS, SIRICIUS, FELIX, SERVULUS, SATURNINUS, FORTUNATUS, and COMPANIONS, a group of twenty-six martyrs in Hadrumetum in North Africa (present-day Sousse, Tunisia) circa 434. According to the Roman Martyrology , they were martyred during the Vandal persecution, however, there are doubts as to the accuracy of this.